How much was the market pricing for CBA’s AUSTRAC fine? CBA’s share price has currently bounced about 1.5 per cent—or $1.8 billion in market capitalisation terms—at the time of writing following news that it has settled the AUSTRAC money laundering litigation for $700 million. CBA had already provisioned for a $375 million fine, which means the profit impact will be $325 million or about 3.25 per cent of its circa $10 billion expected ex-AUSTRAC cash profit after tax for this financial year. The ASX’s guidance note 8 says that earnings changes of greater than or equal to 10 per cent of company guidance are material, which means the total AUSTRAC fine, which was less than 7 per cent of CBA’s expected full year earnings, is not material. This arguably destroys the case of opportunistic class action litigants that were mounting a claim against CBA for not disclosing the Austrac action even though CBA has made it clear it was not aware of the pending litigation until the action was actually filed. To figure out the implied market pricing of the AUSTRAC penalty I had my analysts quantify the immediate market impact following the AUSTRAC announcement on 3 August 2017 and in the period after the filing of its second amended claim. The chart below summarises the results of this analysis. By close of business on 4 August, CBA’s share price had fallen 4.2 per cent compared to a 0.3 per cent average decline in the other three major banks. In market capitalisation terms, CBA had lost $5.6 billion of value, which is 8 times the size of the final agreed fine disclosed today or 3.1 times bigger than the rebound in CBA’s share price so far. 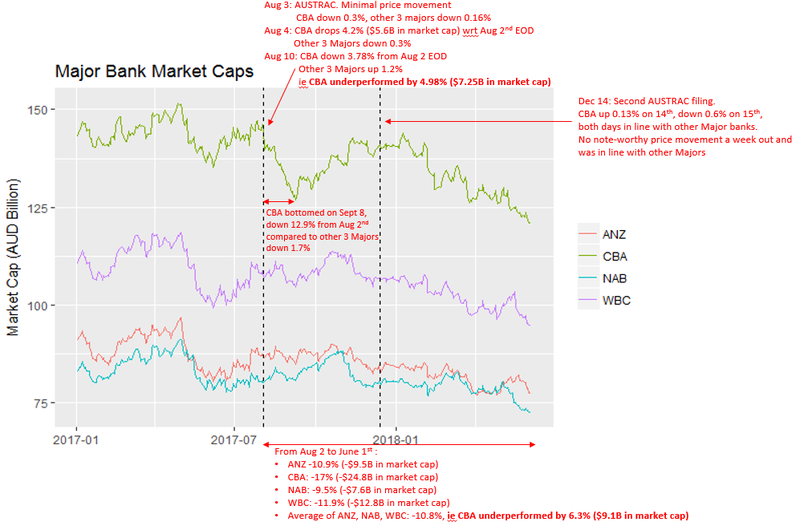 If we then extend the analysis to run from 2 August 2017 to 1 June 2018, we find that CBA’s share price declined 17 per cent compared to an average loss of 10.8 per cent across the other three majors. CBA's relative underperformance of 6.3 per cent equates to $9.1 billion in market cap terms. So the market was pricing in a circa $5.6 billion penalty and associated losses as a result of the AUSTRAC action and potentially much more—up to $9.1 billion—if we account for the price performance in the period since. What might this analysis be missing? The first is some money laundering remediation in terms of system changes and operational processes. A second might be CBA brand damage. A third is the fact that CBA has historically traded on a very expensive basis compared to the other major banks in price to book value terms, although this has been justified by the fact that CBA has historically produced much higher returns on equity. Since 2015 I’ve argued the majors should be trading at around 1 to 1.5 times book value as their returns on equity fall to closer to their cost of equity. CBA’s RoEs remain a stand-out, so its current 1.8 times book value ratio might be justified, although much depends on the outlook.